The public is being asked to help at archaeological dig at Glendalough. The dig site at Glendalough. ARCHAEOLOGISTS HAVE STARTED digging at one of Ireland’s most iconic heritage sites and members of the public can get in on the act. As part of National Heritage Week, children and adults have been afforded the opportunity to help dig at Glendalough in Wicklow. Since last Tuesday, dozens of people have been helping the excavation at the famous site. For years, the UCD School of Archaeology has been running fieldwork in the Glendalough Valley which they say is transforming their understanding of the landscape. The school is currently carrying out a dig for the month of August in a field immediately west of the round tower and main monastic complex. According to the excavation team, the ditch contains large amounts of 12th and 13th century ceramics. Graeme Warren, who is one of the directors of the dig, said that inside the ditch lies ”a complex of pits and substantial post holes – some of the latter dating to c 800AD”. These may provide evidence for early activity on the site. Artefacts include many objects with Hiberno-Norse links in the ninth and tenth centuries, suggesting that the Viking influence at Glendalough extended to much more than simply raiding. This year there is a wide range of events giving people a chance to find out more about Glendalough, made possible by funding from both Wicklow County Council and The Heritage Council. Today is ‘Big Dig’ day for children under 12 years. There will also be tours of the excavation sites until the end of the month. 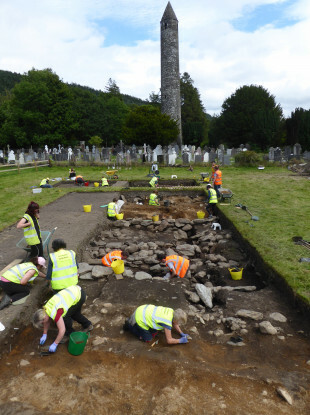 After that, members of the public will have the chance to take daily tours of the excavation works and also visit Glendalough graveyard – an important landmark which dates back hundreds of years. Email “Fancy yourself as a bit of an Indiana Jones? Now you can experience what he did on his day job”. Feedback on “Fancy yourself as a bit of an Indiana Jones? Now you can experience what he did on his day job”.